Are there life circumstances that may be conducive to contracting De Quervain´s syndrome (De Quervain tenosynovitis)? What type of doctor should perform surgery on De Quervain´s syndrome? What can you do if months after surgery you still experience pain in the operated area? What can you do if during primary surgery the radial nerve has been severed? Yes! For instance young mothers who have to lift their newborns/infants may develop De Quervain´s syndrome because they are not used to that lifting motion. In the same way any unprecedented manual activity that requires a series of frequent motions that one is not accustomed to, may favor De Quervain´s syndrome. Surgeons, hand surgeons and orthopedists usually operate on the wrist in case of De Quervain´s syndrome. I do recommend to each concerned patient to inquire prior to committing to surgery on the operators experience level in performing hand surgery interventions. In a case like that the situation should be analyzed by an experienced hand surgeon. Some of the reasons leading to such after-surgery pain may be eliminated through secondary surgery. (e.g. if the tendon sheath has not been separated properly/entirely or if there is a sub-sheath within the main-sheath that has been overlooked before and needs separating). TENs unit used to treat pain associated to a damaged radial nerve. This is a particularly difficult situation. It may – especially in the early stage – be recommendable to reconstruct the nerve microsurgically. However, should the patient retain a neuropathic pain, the early administration of drugs along with the application of a so-called TENs unit mabe beneficial. This method sends gentle electrical impulses into the nerve strands. The goal of this therapy approach is to stimulate the damaged nerve in such fashion that it will help prevent pain signals from reaching the brain. 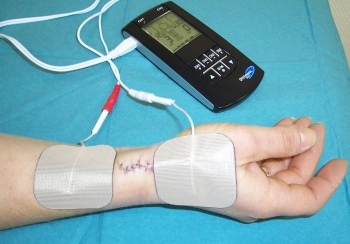 The image shows such a TENs unit in connection with a damaged radial nerve following surgery on the first extensor compartment.